I feel guilty that I have not written a column on "Dreamers," those children who were brought illegally into the United States by their parents. The reason I find it difficult to write such a column is that for me the whole idea of deporting Dreamers is so mean and unjust that I find it incomprehensible that anyone would want to do it. It is especially appalling as we conclude the Christmas season to hear Christians denounce amnesty for Dreamers. Did they listen to the Gospels at all during Christmas? Do they not understand that Jesus, Mary and Joseph were refugees fleeing for their lives to take sanctuary in Egypt? Do they not realize that Baby Jesus was a Dreamer in Egypt? Where are the biblical fundamentalists who say that American law should be based on the Bible? Christians, especially those who believe that scripture should be the foundation of American law, should be leading the charge in support of Dreamers, refugees and other immigrants.Instead, what we see is too many Christians siding with a president who holds Dreamers hostage for ransom $18 billion to pay for his wall along the border with Mexico. Legislation to protect Dreamers is urgently needed; a wall is not. Yet, Donald Trump insists that he will not sign a bill protecting Dreamers unless it includes his wall. If baby Jesus had been reared to his teens in Egypt, would he then have demanded that Pharaoh's officials give him permission to stay because his entering was in ignorance and he had dreams of a good life there, the only home he had known? Methinks you miss the point. Well, then, what is the point of asserting that the baby Jesus was a Dreamer? 'Omnia exemplia claudicat' as the Latin expression goes, and yes, this one limps. Still though the point is that the Holy Family was forced by circumstances to live in a foreign land. Jesus (qua man) undoubtedly learned after he grew up of the extreme difficulties his foster father and mother had in their efforts to keep him alive and safe. It's not that difficult then to see that Jesus well understood the plight of peoples uprooted by circumstances beyond their control. Jesus the student of scripture must have been fascinated to learn about his Jewish ancestors enslaved in Egypt and who dreamed of returning to the "land of milk and honey." Jesus understood first-hand (or, if he was very young in Egypt, second-hand) the plight of a refugee. I agree. But, would Jesus have wanted to stay in Egypt? Would he have insisted on living in Egypt? Not likely. Moreover, almost none of the infants brought here illegally by their parents were refugees fleeing the threat of death. So, the metaphor of baby Jesus a Dreamer is not limping but crippled; nay, the metaphor has no legs. I have a theory about all the immigration from south of our border. I believe a merciful God is giving us another chance. This country has aborted, and often selfishly birth controlled its population to such an extent that our population is shrinking. So, God is now saying, "OK, USA, here's your chance to make up for all that. Free of charge--I am sending you a lot of people for you to feed, educate, and care for until they can make it on their own. I will bless you if you do your best to assimilate them." Good point! Answer: what happened to the Germans in 1939. Only in Pope Francis's and now Father Reese's imaginative comparative can one equate the Holy Family's travel to and relatively short stay in Egypt in the same category as the hundreds of thousands refugees today. The Pope failed to note that the Holy Family returned to Nazareth while Herod was still King without any problem. Further in Luke 2:22-40 the Presentation in the Temple gospel the Holy Family returned to Galilee without a short side-trip to Egypt. Pope Francis and his political adivisors are totally misinformed either through a failure to study and understand the situations in the Middle East, Africa and the Americas or to rely on the leftist advisers when he offers advice to the world on the refugee problem.The Pope should be emphasizing that these refugees from the Middle East and Africa are fleeing from the internicine religious Sunni vs Shia warfare and homicidal Muslim hordes labeled,ISIS, Boko Haram, et al, targeting non-muslims, in particular Christians, that are devastating their homelands. The refugees from Mexico, Cuba and Central/South America are fleeing corrupt politicians/government officials and vicious drug lords. And where do these homeless want to go? They are heading to those countries whose socio-economic systems the Pope condemns as "bad, unjust" and even worse. The Pope should be lecturing the leaders of those countries to improve conditions so that their citizens do not have to leave instead of calling out those countries that he insists must absorb them. Why are the two quotes from Matthew any more definitive than Luke 2:22-40 that made no mention of a flight into Egypt? See my comment on Herod below. The Pope didn't note that the Holy Family returned to Nazareth while Herod the Great was still king because he wasn't. 4BC and IBC and that another Herod, his son Herod Antipas, was the King from before the birth of Jesus and at His death 33 years later. Did you mean he should speak out against corruption in South American countries like this? "religious persecution in letter to Middle Eastern Christians"
So the Pope is active by letter to the Catholic choir and by radio probably only to those who listen to Catholic radio broadcast. That is leadership? Where is his condemnation of the corrupt leaders of the countries by name and excommunication for those of the Catholic faith who continue their corrupt/criminal activities? Where is his calling on the leading religious leaders of Islam by name to end their internecine wars, their support of terrorist organizations and their support of the teachings in the Koran that call for "death" to unbelievers. "Every white person in this country has ancestors who came here as refugees or immigrants." Unfortunately Father Reese reverts to this much used canard to justify illegal entry as actually America is a nation of legal immigrants who arrived here through government immigration locations, Ellis Island in New York for one. Immigration police patrolled the streets of New York with authority to ask individuals for their immigration papers and if they could not produce proof of legal entry they were arrested and deported. Most while while holding on to their homeland's customs, became Americans, learned English, voted legally, raised their children as Americans and insisted on a good education and many never returned to their country of origin. The Federal government's failure to enforce its own immigration laws and to secure the borders has completely shredded the ideal that the USA is a nation of laws by allowing and funding individuals and religions to aid and abet illegal(immigration) activities. This is a seriously flawed article that can result in more hostility and could encourage more votes for DT and the lawmakers who think like him. No, Jesus was not a “dreamer”. Saint Joseph was scrupulous in obeying the law - so was Jesus himself. I can sympathize with the plight of Deamers but I find your argument on what a Christian must hold to be fundamentally specious. "holds the Dreamers hostage for ransom $18 billion to pay for his Wall along the Mexican border. Legislation to protect the Dreamers is urgently needed; a wall is not". Contrary to your assertion I as a Christian can hold that both Dreamer legislation AND a Wall is needed. And such a position is logical and consistent with the facts that generated/generate the Dreamer controversy. It is conveniently myopic of you to ignore that the Dreamers are only here because of a lack of border enforcement; and that a Wall may indeed minimize the possibility of future in which minors are illegally brought across the border to create yet another Dreamer crisis. 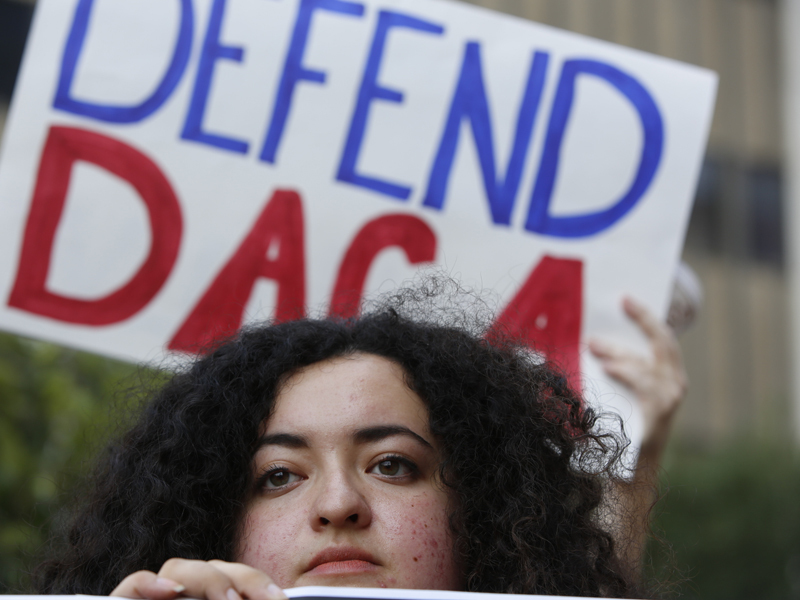 If I were to adopt your language it would be that "Dreamer legislation is being held hostage to minimize the chance of future Dreamer crises"
I also note that the Dreamer problem has been with us for over 20 years and yet until The DACA Executive Order was passed in 2012 there was no great political drama playing out about their immediate deportation. Indeed Father Reese, perhaps you could point out a column written by you prior to 2012 pointing out that it was a Christian moral imperative to immediately pass legislation to protect the Dreamers. Judging by your CV at America Magazine you had plenty of opportunities to write, or sponsor as the Editor, a series of such articles. Thank you Fr. Reese for continuing to remind people - people who call themselves christian, followers of Christ - what being christian really means. Many will continue to attack you. So we must pray that the words of Christ will someday reach them, and that they will be converted. punishment to "judgement day." The Koran tells followers of Muhammad to kill us "infidels."